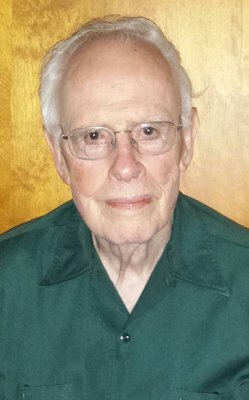 Meet your neighbor James R. Baker, of rural Lomax, born Oct. 4, 1923 and raised in Burlington, IA. His parents are the late Roland and Velma (House) of Burlington who farmed and then owned the Union Cab and Yellow Cab company in Burlington, a big business then and was all hush hush as to his clients and whereabouts. He also drove a truck for Yetto Oil. James married the love of his life 70 years ago, Joy Chandler Baker born in rural Lomax, daughter of Ray Chandler and Leafa Vaughn Chandler, and he says "We've never had an argument-she was and still is my best friend". Jim and Joy had three sons born to this union: (one deceased-Gail), Roger (Angie) of Cedar Rapids, who manages a grain elevator and Carl (Beth) who is a bldg. contractor in Louisville, KY. They also have 7 grandchildren and 7 great grandchildren. Roland grew up with an older brother Harley and younger sister Geraldine Peterson who settled in the Daville, IA area. Jim's education was 12 years in Burlington schools graduating with BHS class of 1941. He worked from "41 to "43 at the IAAP. In March of "43 he began working for Pan American World Airlines (Pan AM) in Miami, FL until his retirement. James started as a machinist and after 10 years, moved to maintenance management 25 years. For two years, their family lived in Brazil building a FAA certified aircraft engine overhaul facility. It was very educational and the family learned various languages and made many friends. Jim and Joy are members of the First Christian Church of Burlington, IA known as "the sweet corn church" due to its annual fundraiser and belongs to Kiwanis. He enjoys traveling, woodworking making mantel clocks, little tables and the like. As far as future plans, he and Joy are celebrating the 70th wedding anniversary on May 18th at the First Christian Church from 1 to 3 pm. and then he will work on reaching their 75th!